Audio CD Maker is an easy and affordable way to create high quality CD's from your MP3 files. 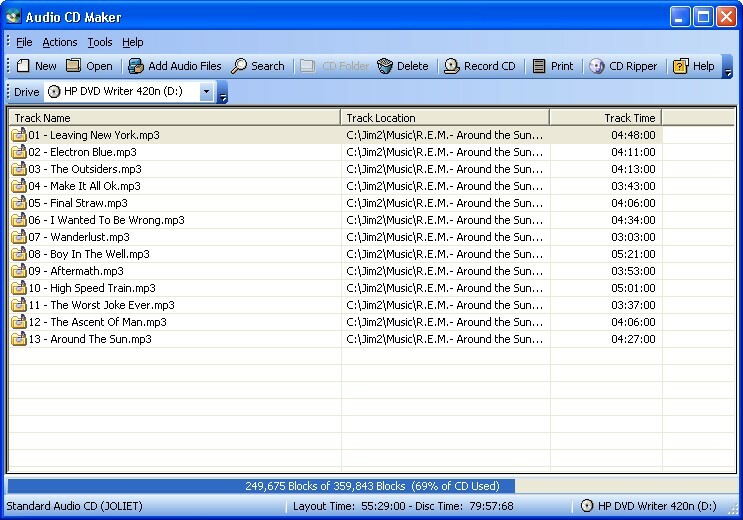 Audio CD Maker also allows you to create both standard audio and MP3 format CD's that can be played in any MP3 Player. Features include the ability to burn MP3 files on the fly, smart recognition of CD drives and CD sizes, burn-proof technology and the ability to print back tray inserts for audio CD's or standard track printing. Audio CD Maker is the only audio and MP3 CD creation tool you'll ever need and is easy enough to use for all levels of users. Qweas is providing links to Audio CD Maker 5.6 as a courtesy, and makes no representations regarding Audio CD Maker or any other applications or any information related thereto. Any questions, complaints or claims regarding this application Audio CD Maker 5.6 must be directed to the appropriate software vendor. You may click the publisher link of Audio CD Maker on the top of this page to get more details about the vendor.